GAZA, Nov 19 (Reuters) - Even as neighbours picked through the rubble of their destroyed house for survivors, the stunned Dalu family arrived at Gaza's main hospital on Monday to collect the bodies of nine relatives for burial. "Is this your wife?" asked a medic inside the morgue. "Ahh, what happened to your face sweetheart?" her husband said, weeping and collapsing into the arms of his spouse. The woman's face was burnt beyond recognition. Nine members of the Dalu family, a mother and her four children, a grandmother, great grandmother and two aunts died in the Gaza strike. Two other neighbours were also killed as the building collapsed. Ninety Palestinians, more than half of them civilians, have been killed since the hostilities began on Wednesday, hospital officials said. Three Israeli civilians have been killed. "They killed a family that was safe and happy," said Hatem Dalu, 40, a relative and a grocery owner. "For no reason, Israel has committed a massacre, an ugly crime. All those victims were either children or women," he said, crouching on a hospital staircase. "Resistance created a new formula. 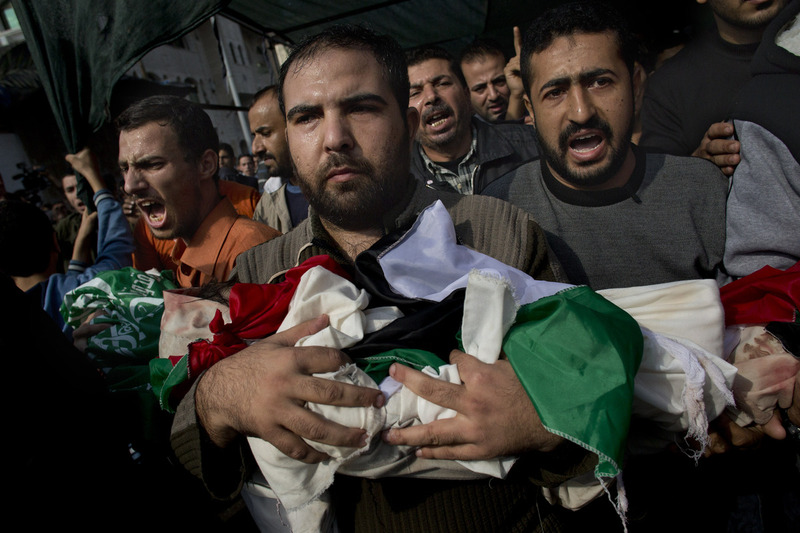 If Gaza is hit the resistance will hit Tel Aviv and beyond Tel Aviv," said Hamas spokesman Sami Abu Zuhri at the funeral.